A nationwide voting committee has selected the finalists for some of the most prestigious national awards in college men’s volleyball. Off the Block announced on Friday morning the finalists for the Lloy Ball Award, Bryan Ivie Award, Karch Kiraly Award, Erik Shoji Award, Ryan Millar Award, International Player of the Year, Division II National Player of the Year, the Off the Block/Springbak, Inc. National Blocker of the Year and the Off the Block/Springbak, Inc. Naitonal Server of the Year. The voting committee for these nine awards was comprised of about 25 college men’s volleyball head coaches and volleyball media members from around the nation. For each national awards, the top three vote-getters were named finalists. The overall winner and total voting results for each award will be announced on the Off the Block website throughout next week and leading up to the start of the VolleyFour on May 3. Off the Block is the nation’s leader in college men’s volleyball coverage. In addition, the college men’s volleyball website has annually presented national awards to recognize outstanding individual performances during the college men’s volleyball season. 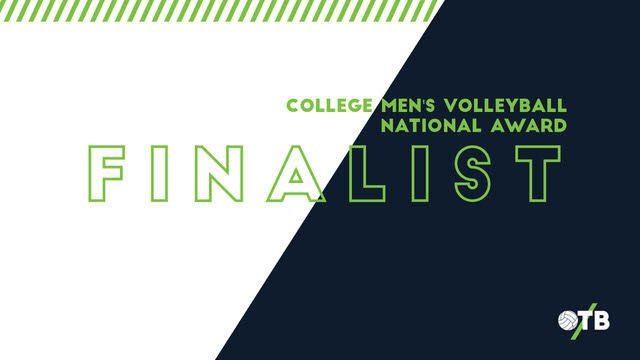 Check out below the finalists for this year’s college men’s volleyball national awards and more information about each award. The Lloy Ball Award is given to the nation’s best setter in NCAA Division I-II men’s volleyball during the regular season. The annual award is named after the former U.S. Olympic gold medalist and Fort Wayne All-American setter Lloy Ball and is selected by a nationwide voting committee of college men’s volleyball coaches and media members. The Division II National Player of the Year is awarded to the nation’s best player on a NCAA Division II men’s volleyball team during the regular season. A nationwide voting committee of coaches and media members select the winner of the award. The Off the Block/Springbak, Inc. National Blocker of the Year is annually awarded to the NCAA Division I-II men’s volleyball player with the best front-row defensive performance during the regular season. This was the first national award organized by Off the Block and each year is selected by a nationwide voting committee of college men’s volleyball coaches and media members. The Off the Block/Springbak, Inc. National Server of the Year recognizes the top individual serving performance from a NCAA Division I-II men’s volleyball player during the regular season. The annual award is selected by a nationwide voting committee of college men’s volleyball coaches and media members.